The Brony fandom has a distinct lack of visual novels, aside from that My Little Dashie demo and its sibling, Welcome to Ponyville, which is fairly surprising given the amount of talented artists and writers we have lying around, and how quickly these games can be scripted in a good engine such as Ren'Py. Sensing this void, the Zap Apple Project team hopes to fill it with their upcoming visual novel titled Starswirl Academy, and it stars some unrevealed colt in high school who befriends humanized versions of the mane 6. In other words, this is your stereotypical visual novel about schoolgirls and romance, and like many of its peers has seperate SFW/NSFW versions. At least it had good art going for it: I'd say that it already looks quite professional despite being in such an early state. 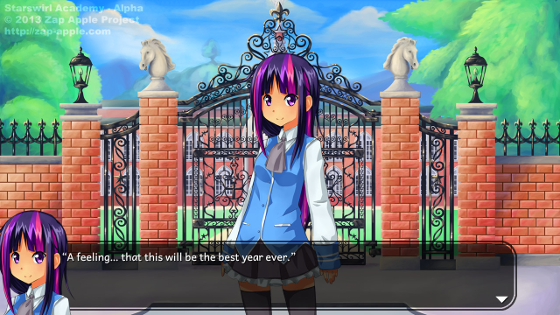 Oh yeah, and since the developers went with a modified version of Ren'Py instead of writing their own engine like Filly Gamez the game runs on Mac OS X and Linux, and an Android port of the game is also planned. Feel like playing a visual novel while you wait? Then I would suggest that you give Juniper's Knot a try. It is fairly short and lacks ponies (even humanized ones), but then again it's not like ponies automatically make everything better, right?